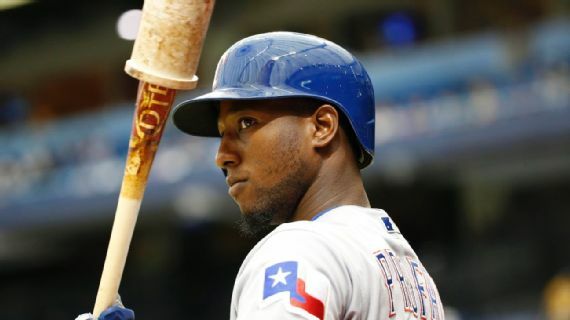 The Texas Rangers have traded infielder Jurickson Profar to the Oakland Athletics as part of a three-team deal that also involves the Tampa Bay Rays, the teams announced Friday. Oakland also reached an agreement on a two-year contract with free-agent right-hander Joakim Soria, giving the A’s a reliable and versatile reliever. The Rangers acquired right-hander Yoel Espinal and left-handers Kyle Bird and Brock Burke from Tampa Bay, and infielder Eli White from Oakland. Texas also got $750,000 international slot compensation from the A’s. Texas sent right-hander Rollie Lacy to Tampa Bay. The A’s also sent right-handed pitcher Emilio Pagan and a 2019 Competitive Balance Round A pick to the Rays. The 34-year-old Soria, a two-time All-Star, went 3-4 with a 3.12 ERA in 66 appearances and 60 2/3 innings this year for the Chicago White Sox and Milwaukee Brewers. The Rangers also signed four players to minor league contracts with invitations to major league spring training. They were lefty Miguel Del Pozo, infielder Nolan Fontana, and right-handed pitchers Ariel Hernandez and Phillips Valdez. Fontana was the only of the four to play in the majors this year. He reached the big leagues each of the past two seasons with the Angels, appearing in 20 games in two stints with Los Angeles this year.